The premises are situated on the edge of Pontypool town centre just off Riverside Road which links into the town centre and the A4043 which provides the main access route way from Blaenavon in the north to the southern end of the valley. The premises are located within walking distance of the main town centre and are directly behind the town’s multi storey car park. The Job Centre is located immediately adjacent to the subject premises as is Riverside Court providing sheltered housing accommodation. To the rear of the property is the Afon Lwyd River. 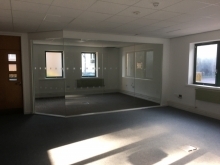 The property comprises of a modern stand alone detached office building on ground and first floor levels providing purpose built office accommodation. The premises are of brick construction under a pitched slate roof having high level cladding panels with anodised aluminium windows and entrance doors. The property has a glass canopy fronting the main access to the premises. The premises have gas fired central heating throughout. We understand that the property has approximately 19 car parking spaces. A ramped access of interlocking bricks provides access into the property. The ground floor circulation area provides WC facilities. 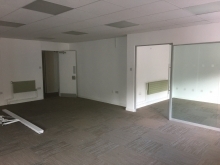 To the left is an office area which is a mixture of open plan and cellular space which has recently undergone some refurbishment works. The first floor provides mainly open plan office accommodation having some cellular space along with further WC facilities. 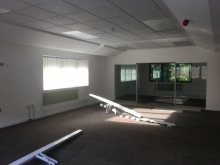 The premises have suspended ceilings with inset lighting throughout. Ground Floor 173.72 m² / 1869 sq.ft. 1st Floor	182.23 m² / 1961 sq.ft. 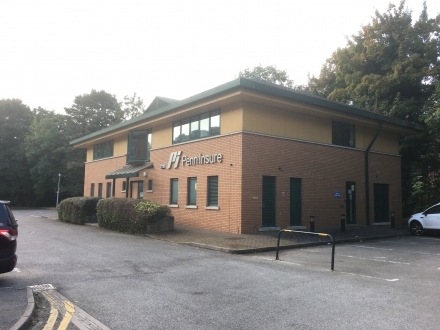 We are quoting a price of £235,000 for the freehold interest in the premises.